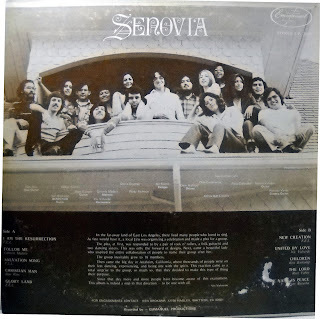 Senovia (Emmanuel L.P. 3000) 1975? This is one that is not in the Archivist, yet. This group is from the Whittier, CA area. Use of guitars electric and acoustic, bass guitar, harmonica, maracas, congas, tambourine, drums, & blocks. Not unlike Truth or Free Spirit this 16 member group does have some rather choral moments, but better that Truth or Free Spirit. Pop-rock numbers mixed with other genre. Some unison singing is spots but also many harmonies. The pop-rock upbeat numbers are ‘I Am The Resurrection’, ‘Salvation Song’,’Glory Land’, ‘New Creation’, ‘Children’, and ‘My Name is Peace’. Definitely makes you want to get up and dance. If you do not like choral music then give this one a try. A few Jazz moments were caught by this listener. A nice harmonica solo and a unique bass guitar and blocks duet. Several more folk style slower numbers including ‘Follow Me’ and ‘Christian Man’ Several FEL songs and several original numbers written in most part by members. Don’t blame me if you find yourself foot tapping. Dance unto the Lord. (Ozark Ken). Again my gratitude goes to the both you. Thank you. I am really, really, really …looking forward to this one. I love the big bands…they were SO MUCH FUN. the same one from LOS LOBOS?! I would say from a quick search of the web for David Hidalgo, that it is the same person. The list of instruments that David plays, location and work on many other artist projects would lead me to say yes. I did not in this quick search find Senovia listed in the projects that David worked on, but the list did not include every project he had worked on. Yes, the very same David Hidalgo. 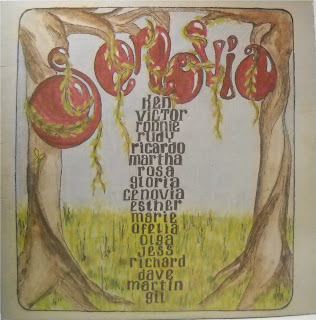 A few years back (around 2012-13), a friend of mine saw Los Lobos in concert and mentioned my mother, Cenovia Madero, and if he remembered being part of Senovia–he sure did. I believe he was around 16-years old. This is a very good example for great about Jesus Music. You can hear how much they enjoy being together and living for Jesus and how much fun it is for them to make music. Hey I'm getting a little late in on the comments here, thanks for everyone's hard work to find out more about this LP and David in particular. It is super to run across an album you personally like and find others equally excited about it. Thanks everyone it fires me up to know something has been a blessing! Newspapers dot com tells me that the album was released somewhere between March first & tenth, 1974.
how can I listen to these tracks? I used to attend church services where they played back in the early 70’s. I have searched high and low for this LP or downloadable tracks, any ideas? I have this LP. Not sure how I ended up with the LP, but I digitized it and have the tracks. Contact me via private message, and we can make arrangements to get the tracks. WoW you are an answer to my prayers Ron. Very interested in digital and vinyl. Can you please contact me via email, TYIA. I have been lookong for this album. My family and I used to attend church services Saturday evenings worshiping with the band & Father Larry. Would like to purchase this album. Anyone know where I can find it?? If you are interested in vinyl, we have some LPs left. I digitized it a few months back. Contact me by email or at 626 533 9406. That’s the David Hidalgo of Los Lobo fame!